Cashiered for lying, Miles is lucky to escape legal charges. Miles has trouble seeing himself as lucky; he has built his life, his self-esteem, on his role as the Little Admiral and covert ImpSec agent. That has just been taken away. He is depressed and despairing. He tries to drown his losses in drink (doesn’t work) and retreats to the backwaters of Barrayar rather than talk to friends and family. Miles returns to Barrayaran civilization, such as it is, to discover that Simon, his old boss, is dealing with his own dire problem. Something has gone terribly wrong with Simon. His once flawless memory has failed him. He has become forgetful and easily confused. When he breaks down during a meeting, talking rambling nonsense, he is hospitalized by his subordinate, General Lucas Haroche. Miles still considers Simon a friend. His attempt to visit Simon is stymied by the curiously uncooperative Haroche, who is determined to keep Miles away from Simon. Miles being Miles, he pushes back. He turns to another old friend, Barrayaran Emperor Gregor. Appointed Imperial Auditor, Miles has the rank to overrule Haroche and personally investigate Simon’s sudden illness. Simon has been betrayed by the neural chip that has given him the perfect memory on which he has relied for decades. Chips do wear out. In this case, Simon appears to have been the victim of deliberate sabotage. Deliberate sabotage requires a deliberate saboteur. At the top of Haroche’s list of suspects? Viewed as a mystery, I didn’t find this too mysterious. The two people at the top of the ImpSec suspect list were very unlikely to be the culprits; one of them is the protagonist of the series, after all. There is actual evidence pointing to them, which suggests that they have been framed. The list of people in a position to frame either of them was pretty short. Miles doesn’t just lose his job. Elena, a childhood friend with whom Miles was once smitten, and her husband Baz retire from the Dendarii for a life that will let them have kids. His current lover, Eli Quinn, chooses being commander of the Dendarii over being Lady Vorkosigan. Another former lover, genetically engineered Taura, is very clearly reaching the end of her shortened lifespan. I am sure that if Miles had had a small dog, it would have been run over before the book was a quarter done. Bujold could have capped this by killing off Miles’ parents, but that would have ruined the plot. When Aral dies, Miles becomes Count Vorkosigan, which is a position of sufficient power and influence that the attempt to frame him would be perilous. What the author takes away with one hand, she gives with the other: Bujold (via Gregor) gives Miles what turns out to be his fantasy job: Imperial auditor. Canned from ImpSec, he shows up with the authority to push ImpSec around. He gets, once again, to be the hero of the day. Points to Bujold for letting Simon sack Miles. Too many authors are unduly protective of their series protagonists. But I think she pulled her punch by making him an auditor before the book is half done. Promotion to an exalted rank is the wrong message to send to a rightfully disgraced hero. Oh well. This may actually be predictable; well-placed persons in aristocratic societies tend to fail up. I suppose one way to further challenge Miles would be to put him in a situation in which his skills and habits are irrelevant or counterproductive. A romance, say. Some non-military, perhaps civil, campaign. But what are the odds of that happening? 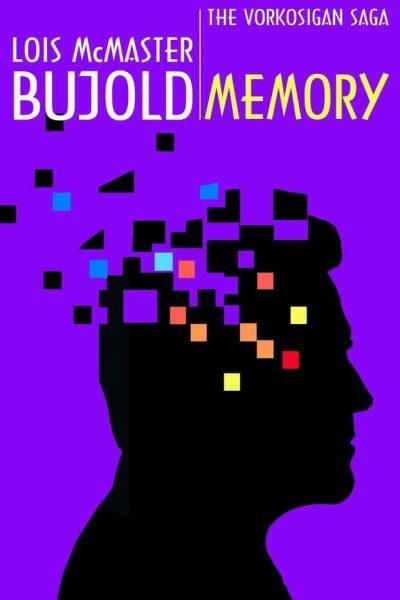 Memory is available here (Amazon). This edition is not available from Chapters-Indigo. 1: Yes, I skipped a bunch of Miles books. Not keen on either Mirror Dance or Cetaganda. Pity you're not keen on Mirror Dance. I would have enjoyed your thoughts on that book. LMB's well-known plot generator is "what is the worst I can do to this character?" Taking away Admiral Naismith is the second-worst thing she could do. Killing off Aral before Miles is ready to settle down, was the worst thing. LMB wasn't emotionally ready to kill off Aral (she said later that killing Aral would be like dealing with her own father's death, which she wasn't ready for) (which only reminded me of what Peter Wimsey said to Harriet Vane in "Gaudy Night," about personal pain being worth bearing, in order to do one's job properly). So this is the book we got. I was always disappointed that by the time LMB killed of Aral, it made no change in how Miles lived his life. In "Memory," Gregor appoints Miles interim Auditor, not permanent one. It's not clear that Miles would later get the job permanently especially as in many ways, Miles is not qualified. Not only is he far too young, but while his loyalty is unquestionable, his honor and character are both subject to question. In short, Miles cuts too many corners and has shown himself far too willing to take morally suspicious actions to further his goal. Gregor is taking a risk in appointing Miles as Auditor. Good review. This is the peak, IMHO, of the Miles series. Nits: as Harimad stated, the initial appointment is interim - he gets the permanent one at the end for doing a good job. And it is then that he loses Elli - incompatible career choices. The final paragraph - I don't know what to say other than Good Idea! At least it didn't contain a pun. Also, maybe Miles could be given, down the road, some more extreme examples of elderly amours :-). Mirror Dance: I have read it, of course, but it isn't in my reread cycle. I'm not sure why. To figure this out I would have to, well, reread it. But when I have picked it up, this has been followed by my putting it back down. Cetaganda: This was written later than one would expect from its place in the chronological order. Bujold's developing writing style shows. This isn't a bad thing, but it fits in poorly with the books around it. Treat it as a quasi-standalone and it will work better.